Six years, 6,000 handmade parts and 15,000 hours of labor. 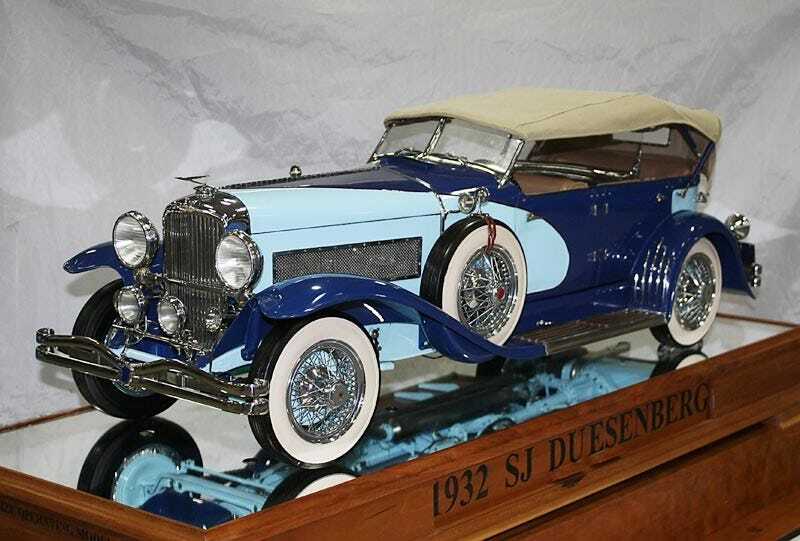 That's the short story of this fully-functional miniature 1932 Duesenberg SJ phaeton. No wonder the builder was recently named Metalworking Craftsman of the Decade. Hemmings tells the story of Louis Chenot, director of mechanical engineering for Leggett & Platt, a supplier of automotive interior systems. Chenot's massive modeling undertaking is a winter project—actually six winters—for the ages. Chenot took the dimensions from Duesenberg authority Randy Ema's J-589, a supercharged D-engine belonging to Jay Leno and blueprints from the Auburn Cord Duesenberg Museum in Auburn, Indiana. Then, he reduced them to 1/6 scale, and hand-formed the multitude of parts with his own jigs, patterns and whatnot. All together, the Duesie weighs 60 pounds. The car's supercharged straight-eight engine—displacing 1.936 cubic inches—has 300 parts in the head alone, including 32 working valves. Chenot formed the block from a 38-pound lump of iron, turned the crankshaft from 4340 steel, the main and rod bearings he made from silver and the cylinder liners he cut from the valve guides of a full-scale Cummins diesel engine. The carburetor is from a model aircraft, and It idles on propane at between 2,000 and 4,000 RPM. Here he is cranking it up with a power drill. Lou won his Metalworking Craftsman of the Decade title from the North American Model Engineering Society. We're pretty sure it was no contest.